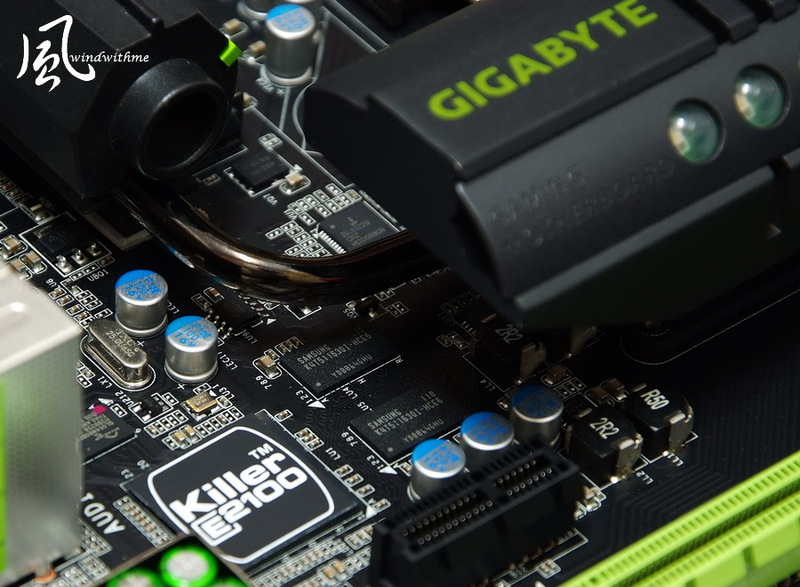 GIGABYTE launched new series in early 2011 called G1-Killer with Intel chipset. First series use X58 chipset and there are 3 models, G1.Sniper, G1.Guerrilla and G1.Assassin. 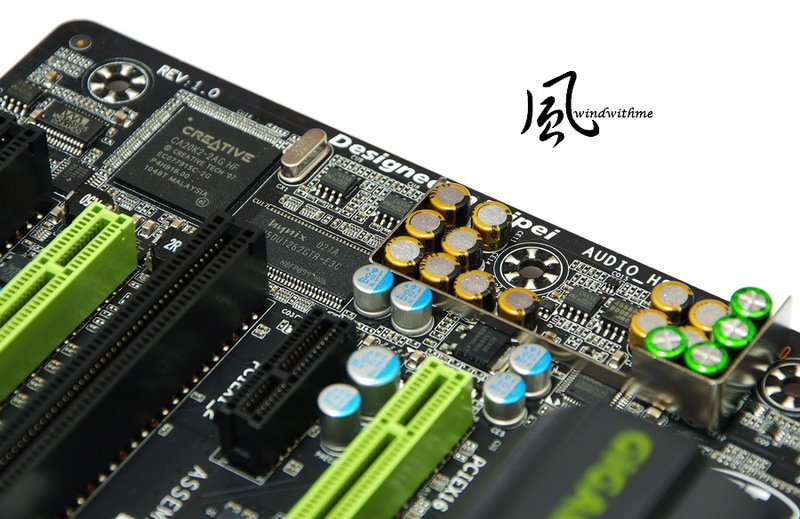 They are same as own high end model UD7, but have less power phases and PCI-E slots. 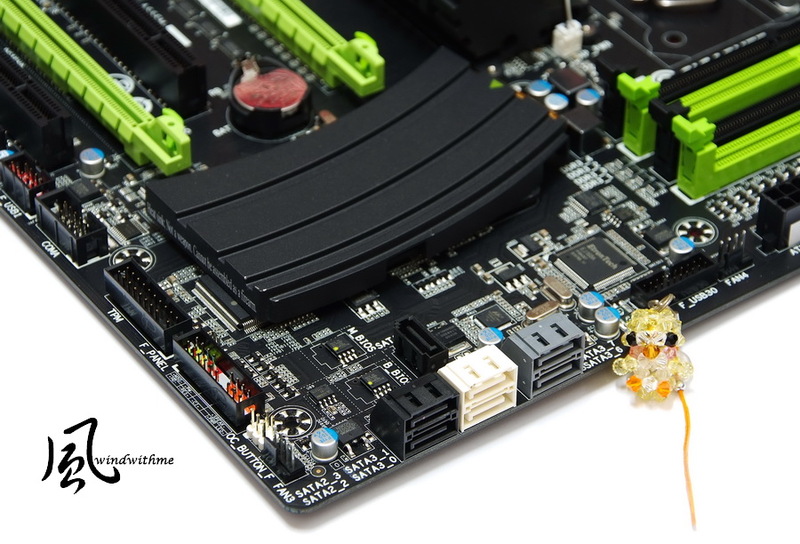 G1 uses high end product components and focus on Gaming which enhance audio and network design. So far, Intel most popular product is Sandy Bridge. It’s been launching less than 1 year, however, there are Z68, P67, H67 and H61 chipset can supports SNB CPU. You can see Sandy Bridge can combine from entry to high end as users demand. From LGA 1155 CPU and chipset quantity, you can see the product life cycle should be longer than LGA 1156. 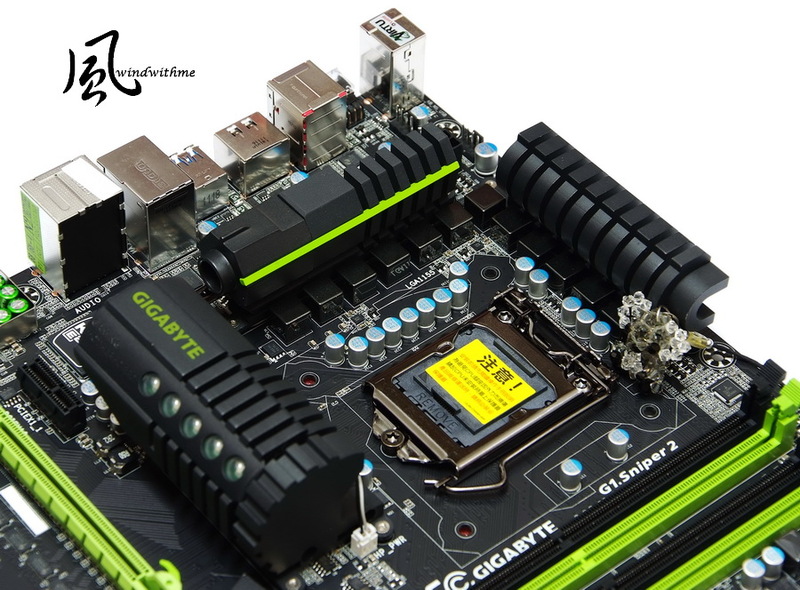 This time, I got GIGABYTE 4th G1 product using Intel latest Z68 chipset with G1 series design concept. This model name is G1.Sniper2. You can see the color tone is black with green. It’s same as previous 3 G1 X58 series as focusing on war visual concept. Sniper2 is ATX and the size is 30.5 cm X 26.4 cm. 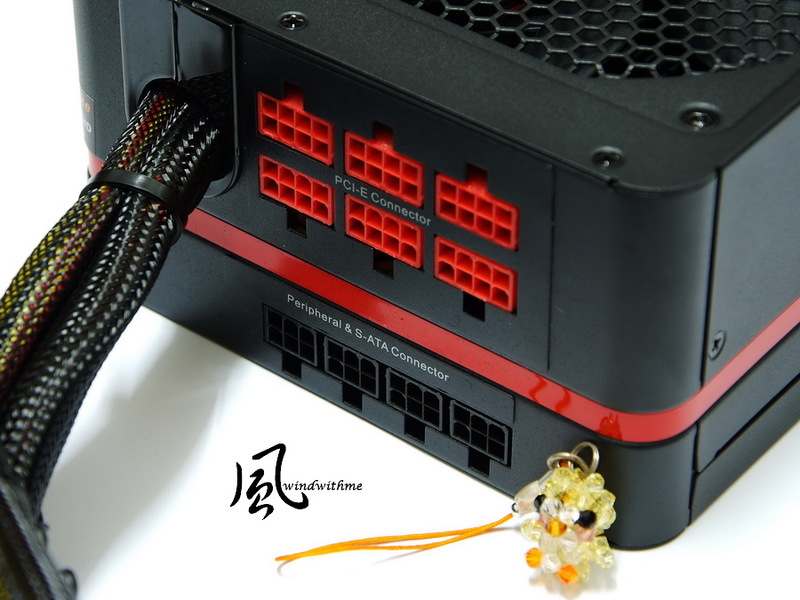 It includes 5 Smart Fan controllable fan header which can adjust Z68 platform temperature more efficient. This time the magazine heat sink has no G1.Killer print. It’s just whole black design. Product manual, Software installation guide, Driver CD, IO panel, SATA cables and SLI bridge. Front Access Control Panel provides 2 USB 3.0 and 1 Power eSATA ports. Left side Quick Boost button can let user switch to OC mode to increase system performance easily. Bottom is G1-Killer poster and sticker. 2 X PCI-E X16 supports AMD CrossFireX/nVIDIA SLI as X8 + X8. Very rare Bigfoot Killer E2100 LAN Chip. Built-in Creative CA20K2 audio chip supports Dolby Digital Live, DTS Connect, X-Fi Xtreme Fidelity and EAX Advanced HD 5.0 technology. It supports max 7.1 channels and High Definition Audio technology. 3 X Black SATA provided by Z68 supporting SATA2. 2 X White SATA provided by Z68 supporting SATA. You can build hybrid RAID 0, RAID 1, RAID 5 and RAID 10. 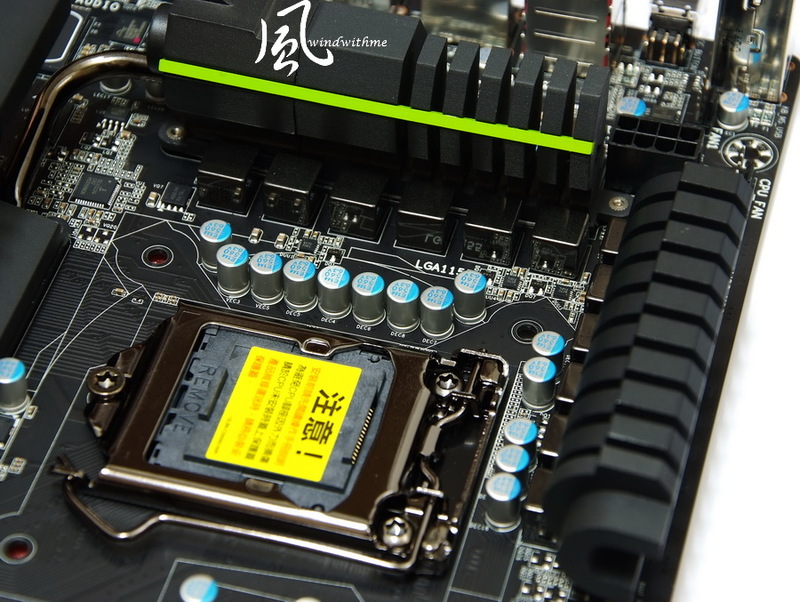 The max performance depends on SATA devices. 2 X Grey SATA provided by Marvell 9182 supporting SATA3, RAID 0 and RAID 1. 2 X 32 Mbit flash Dual BIOS for dual protection. 4 X DIMM DDR3 support 800/1066/1333/1600/1866/2133 and DDR3 max capacity is 32GB. It supports Extreme Memory Profile. 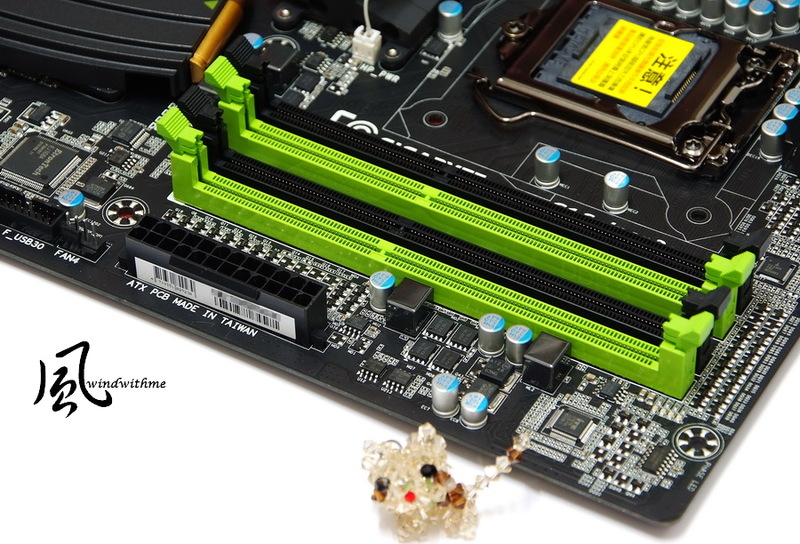 DDR3 uses 2 phases PWM and next is 24-PIN power connector. LGA 1155 CPU Socket. The cover is plating process for better quality. G1.Sipner2 uses 8+2+2 phases PWM. DRAM and Chipset have individual 2 phases. Behind the upper heat sink is an 8PIN ATX 12V power connector. Last edited by windwithme; 09-23-2011 at 02:46 PM. 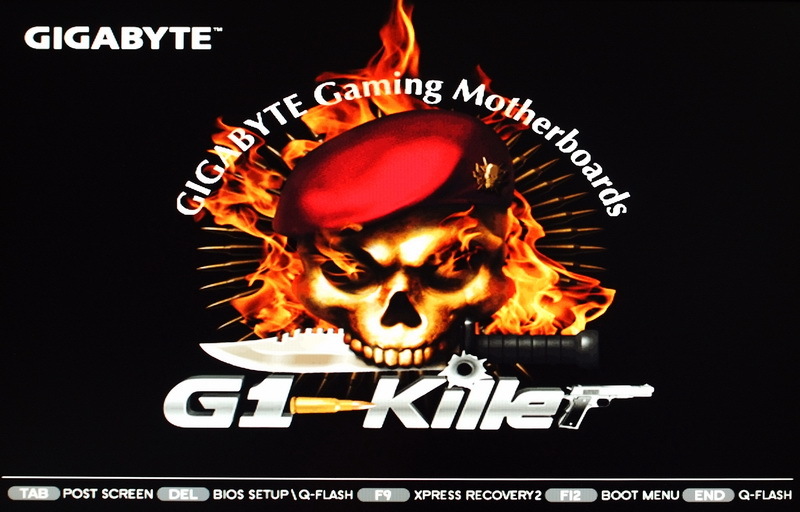 One of G1.Sniper2 key features is Killer E2100 LAN chip, called NPU. It bundles 1GB DDR2 for network traffic control. It can help to offload the network traffic from CPU. Another function is Game Networking DNA technology. It offloads gaming data directly to the NPU by bypassing the Windows Network Stack to save time. The other key feature is Creative Sound Blaster X-Fi audio processor, chipset code is 20K2. It built in 128MB Memory cache for 20K2. It’s only for high end Creative sound card. 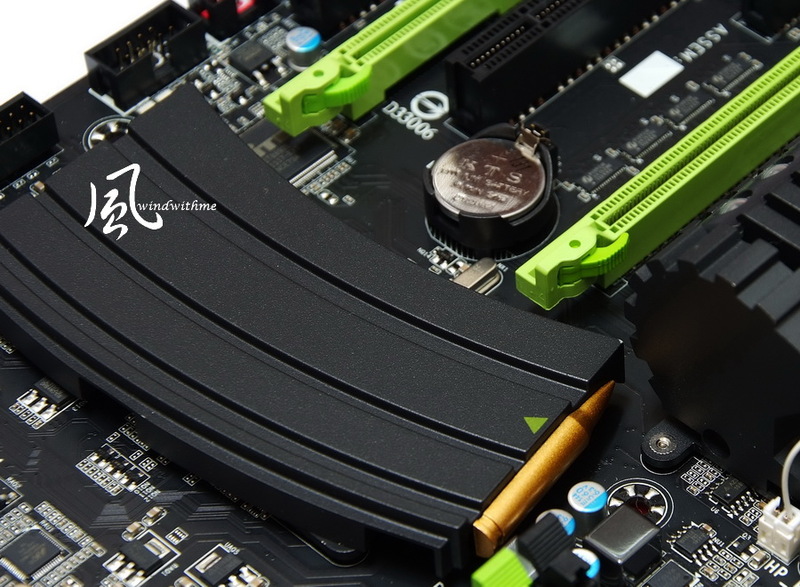 Nichicon MUSE ES(Green) and MW(Yellow) Japanese made audio caps with metal cover which is same as high end sound card design and components. Next is G1-Killer series special design heat-pipe. The design concept is shooting game, also called Locked and Loaded Heat-pipe. The part is a big heat sink. The center has 5 green LED which is on as booting up. The shape is same as magazine. The top is a copper bullet. The heat sink dimension and quality are impressive. VRM heat sink is similar to barrel. CPU is 8 phases Driver MOSFETs design for better power efficiency and temperature control. 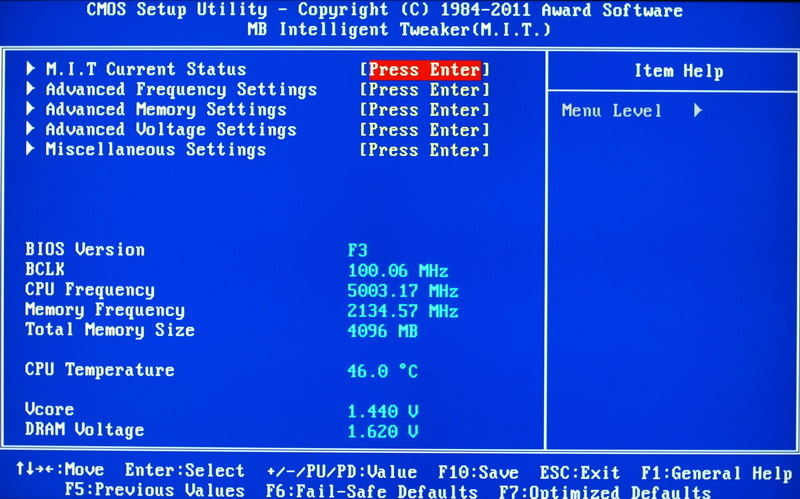 It shows BIOS version, CPU/DRAM clock, DDR3 capacity, CPU temperature and CPU/DRAM voltage etc. You can adjust CPU ratio, clock and DDR3 multiplier. The screen is CPU 100.2Mhz/DDR3 2133 setup. 2600K default ratio is 38, 37, 36 and 35. Turbo Boost 2.0 technology has more critical CPU boost mode. Internal PLL Voltage Override items enhance CPU stability when OC to 5GHz. Z68 default is Enable. 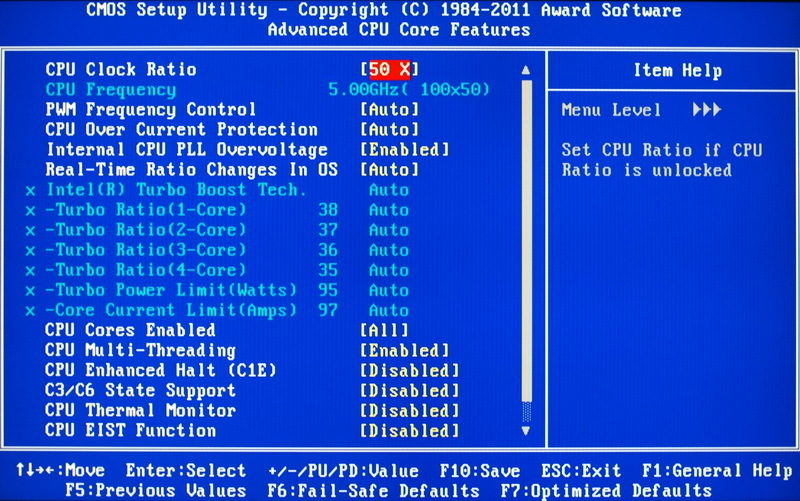 When OC CPU Clock Ratio to 50, I like to disable Intel Turbo Boost and C1E for better stability. Sandy Bridge multiplier has 800, 1066, 1333, 1600, 1866 and 2133. Last edited by windwithme; 09-23-2011 at 02:48 PM. Sniper2 built in one HDMI output. User can use for Intel built-in GPU. It bundles with Lucid Virtu GPU Virtualization technology for user to switch high end 3D graphic card and Intel Quick Sync Video technology. 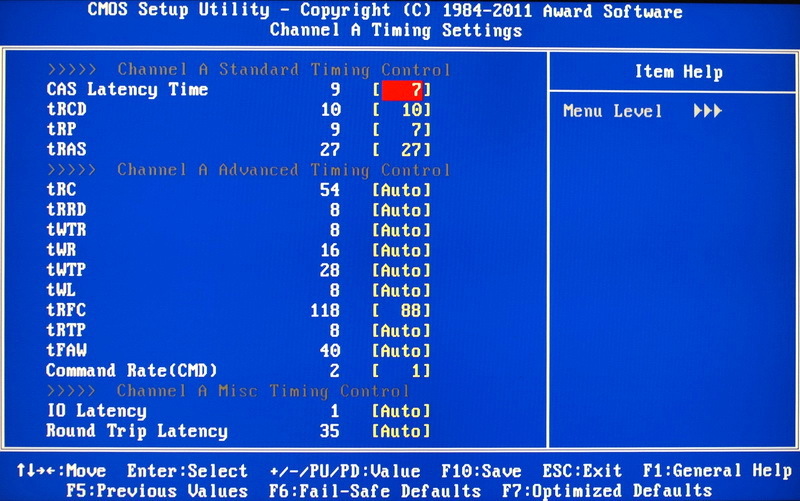 UEFI is a very common word recently. It means 3TB support plus GUI. GIGABYTE all Z68 BIOS support EFI 3TB HDD. For GUI, they still need to catch up. This review I use Intel Core i7-2600K. As 2600K default performance, windwithme has test end of 2010. Recently, the other Z68 OC guide can be reference. If you want to refer to the 2600K default performance, you can search my previous article. The BIOS pics above are 2600K OC 5GHz setup. 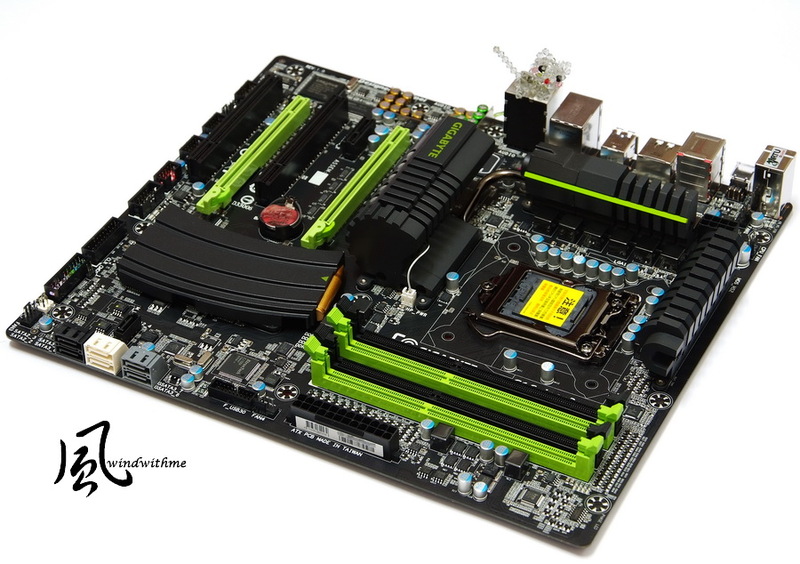 You may need to fine tune your system voltage and clock due to CPU and DDR3 quality. Windwithme reviews are taking long time to fine tune for stable OC. The OC ratio is passing stress burning which is my own requirement. Maybe it’s just an easy performance pic, it takes me several hours for fine tune the most suitable voltage and CPU clock for stable running. With DDR3 OC and fine tune parameters, finally, the CPU and DDR3 are all stable at highest performance. Then I start to lower voltage to find the lowest value. It takes few hours to days. I think the every MB best OC setup is worthy and really useful for users who are interested in OC. I also hope the OC will bring the budgeted hardware into highest performance. 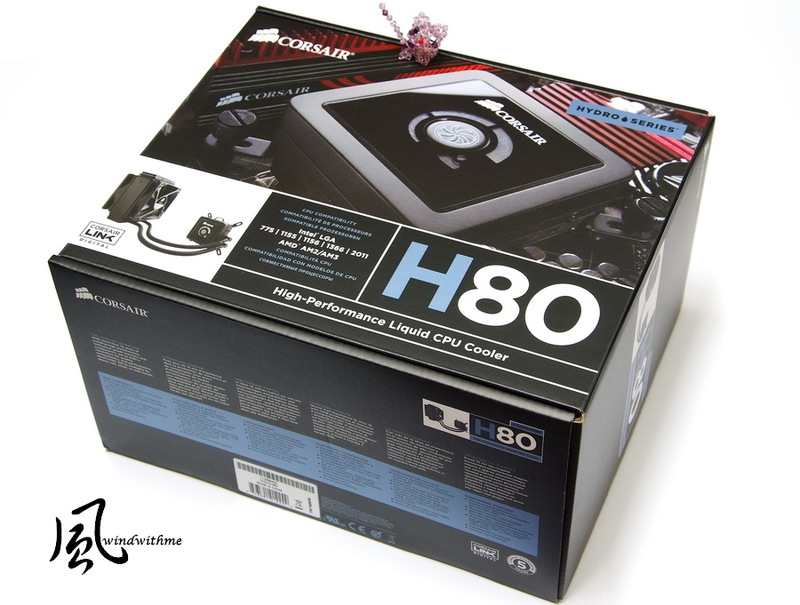 Cooler is CORSAIR latest water cooling product. Hydro Series has 4 models, H50, H60, H80 and H100 from low to high. Below is H80 packing. It’s 5 years official warranty. The package is bigger than perviousH70. All 4 models support all CPU sockets include future LGA2011. Left hand is the all black radiator. The size is 120mm x 152mm x 27mm. The shell is also metal delicate which is better than H70. The both sides can install 12cm fans. The rotation rate can adjust by the button above cooler head. There are 1300, 2000 and 2500 RPM. The fan airflow is 46~92 CFM and acoustic is 22~39dBA. Hydro Series H80 advantage is can install in standard ATC chassis. 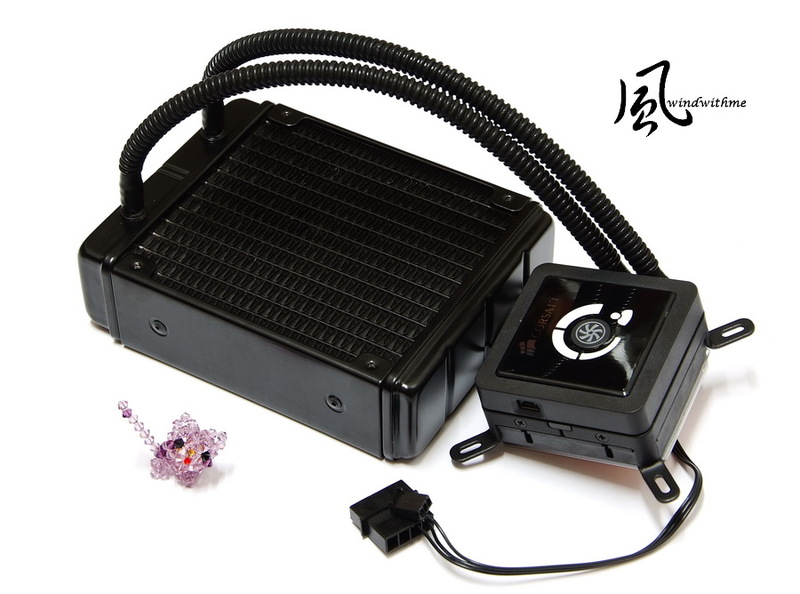 This hydro cooling is very convenient for users. H80 new design improves the cooler head. The first one, the new mounting bracket is more stable and durable. The bottom still keeps the big dimension copper. 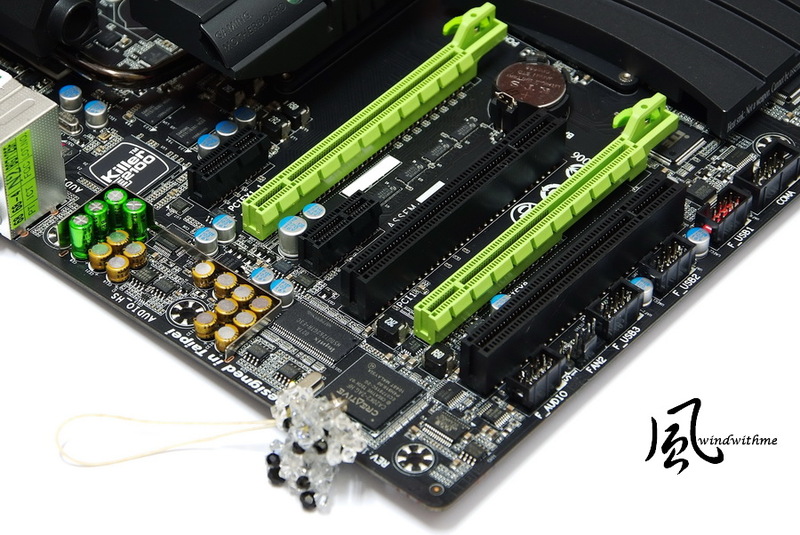 Next is two 4-pin headers for 12cm fans. Near the cooler head, there are one small 4-pin and one big 4-pin headers. They are for MB or PSU to supply power to cooler motor. First of all, let’s test 2600K OC 4.5GHz performance. This setup is most ideal OC range for most suers. Last edited by windwithme; 09-23-2011 at 02:49 PM. 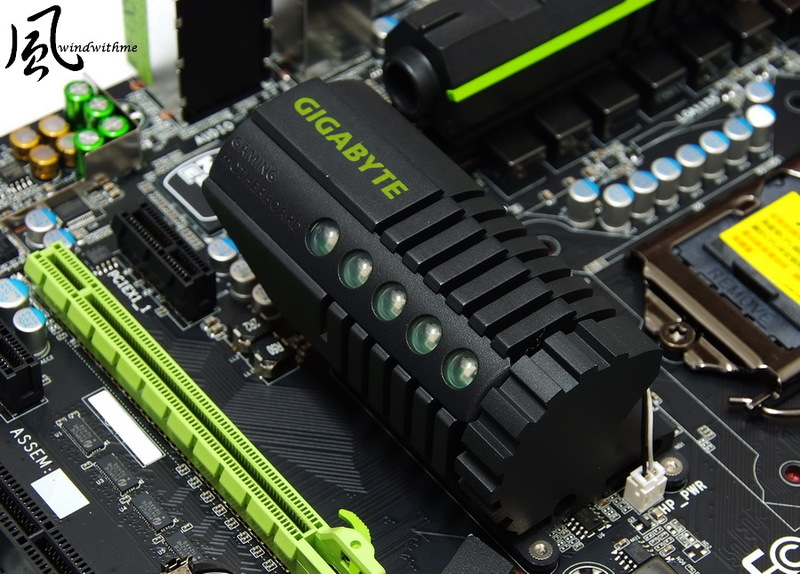 The CPU voltage will be various as different CPU quality. 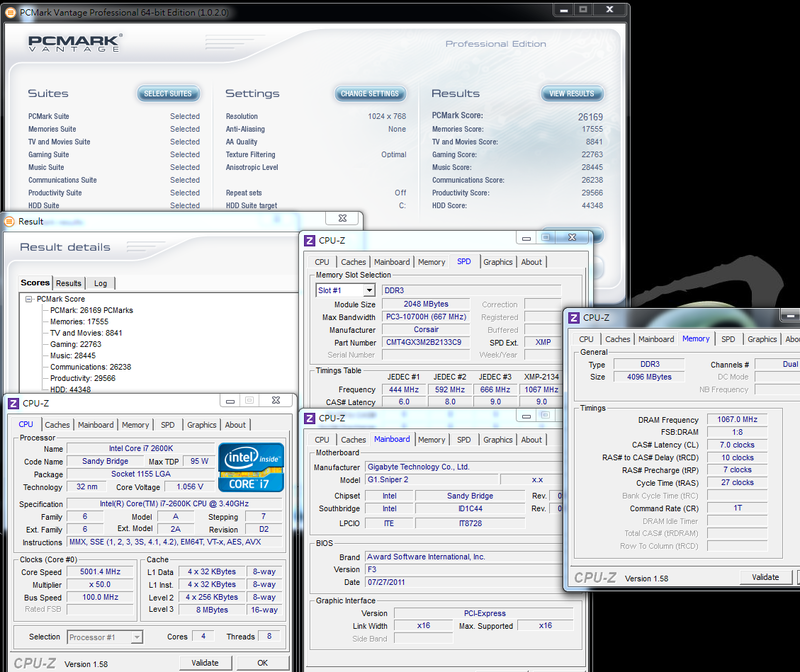 Actually, if the cooling is good, 2600K no need to add too much voltage from 1.245V to 4.5GHz. 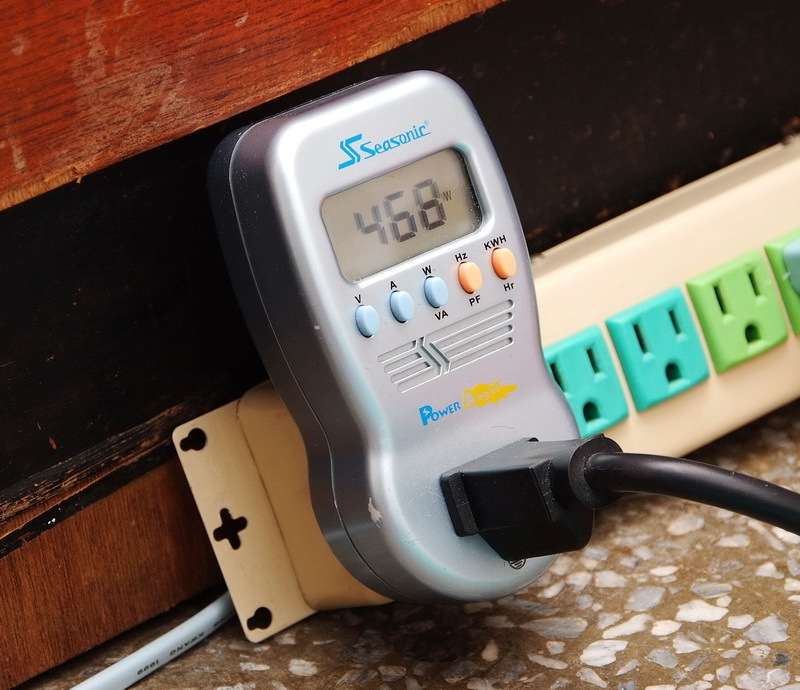 The above test is setting as 1.250V. It can pass most benchmark software and burning test stabile. Sandy Bridge as Intel 2nd generation Core I structure. The CPU single thread performance is excellent. 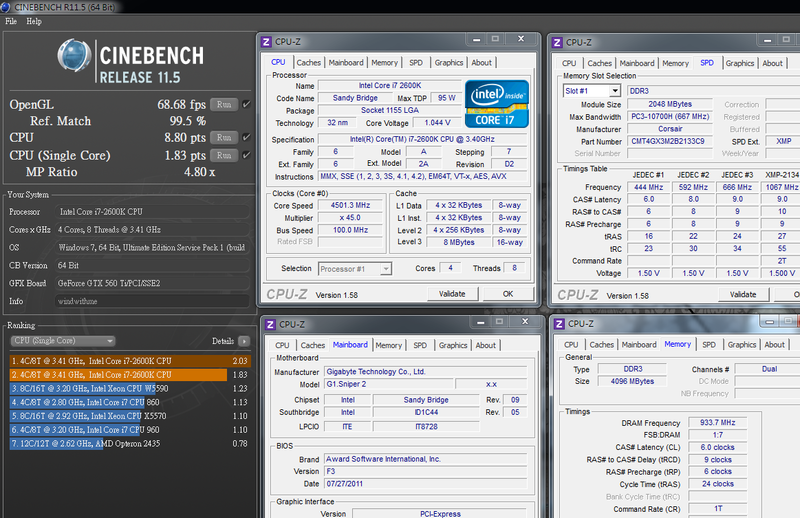 4.5GHz clock to test all benchmark, the score and performance are very good. 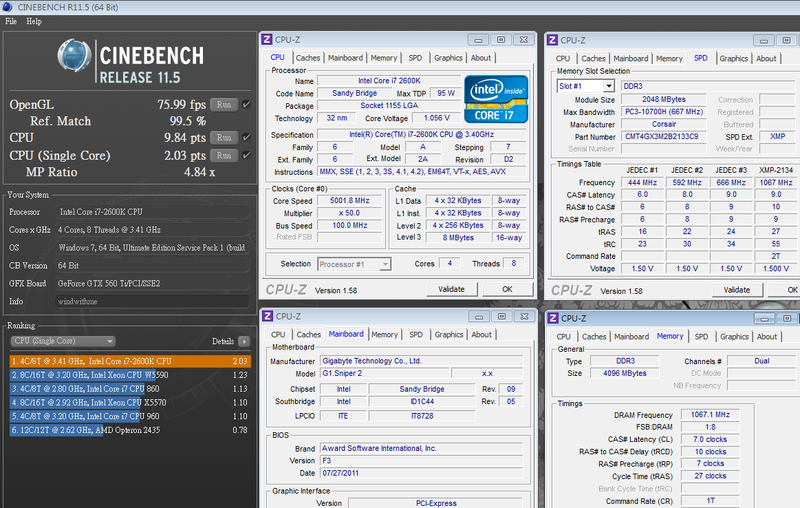 Also, OC to 4.5GHz is a stage. You have to control voltage and temperature well. 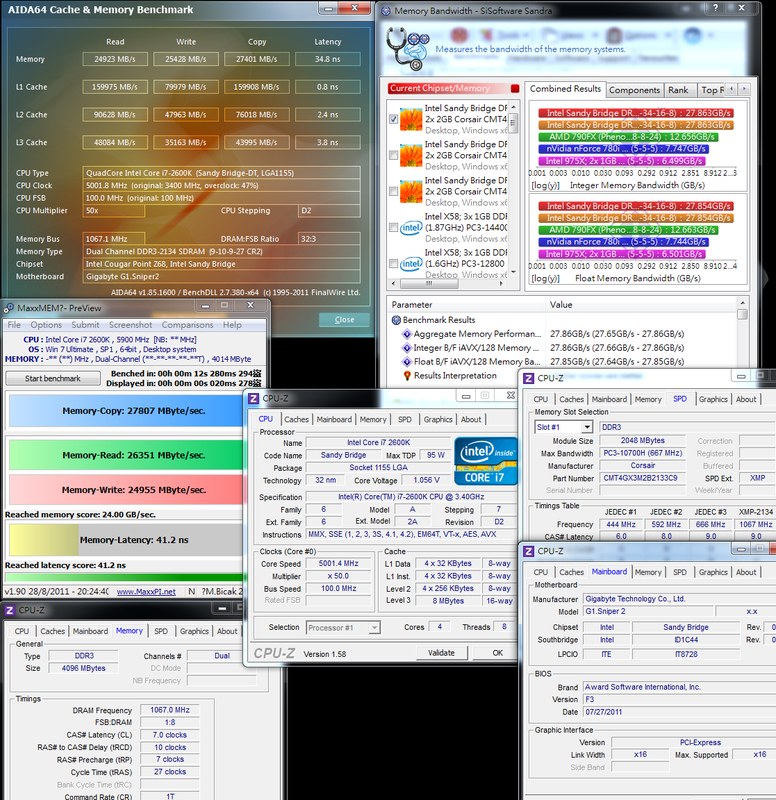 Sandy Bridge DDR3 bandwidth improves a lot. It’s even same as LGA 1366 3-channel. 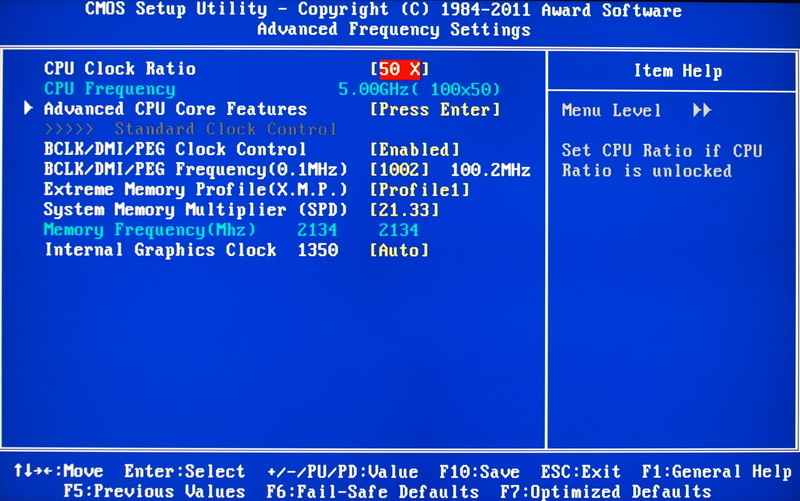 If DDR3 quality is good enough, even CPU clock is the same, you still can run at 2133. 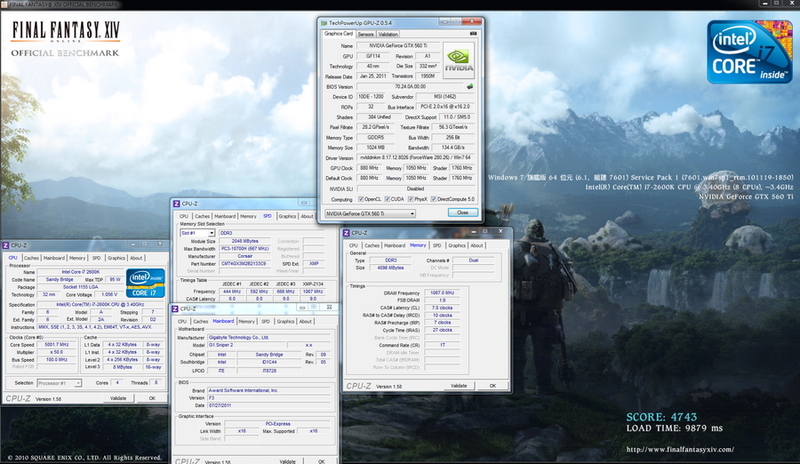 Using CORSAIR DOMINATOR-GT to test 1866 CL6, the bandwidth and performance are very good. The temperature result is good. It owes to H80 water cooling system as well. 2600K OC to 4.5GHz won’t be a problem if you use mid-high end coolers. This is also 32nm advantage. I am looking forward to Panther Point next year. 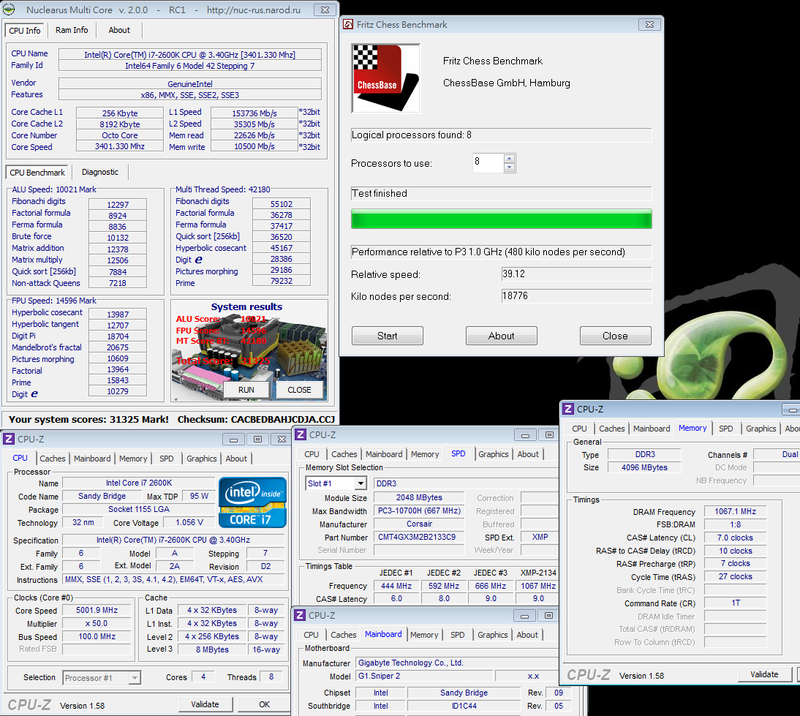 For 2600K OC to 4.5GHz add GTX 560 Ti, the power consumption is very low. 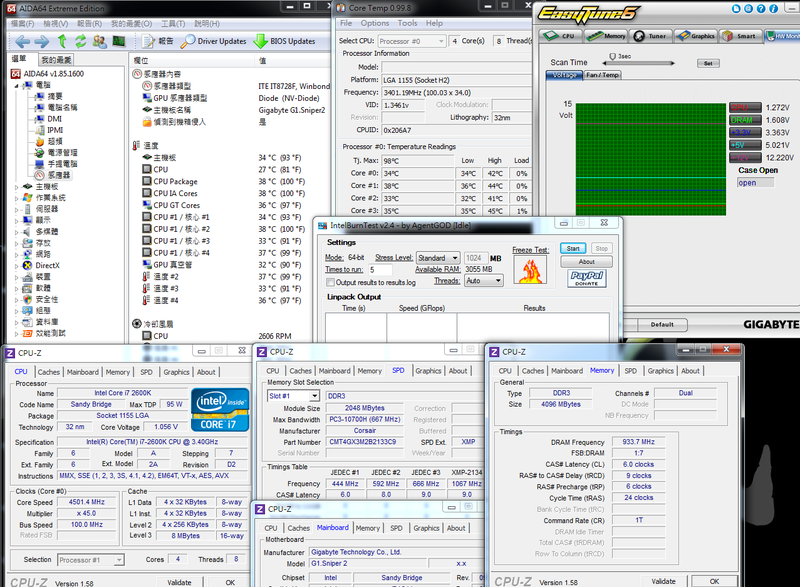 For full speed, CPU full speed is around 200W and above test OCCT CPU and VGA is 410W. This value just needs 550W PSU for whole system. 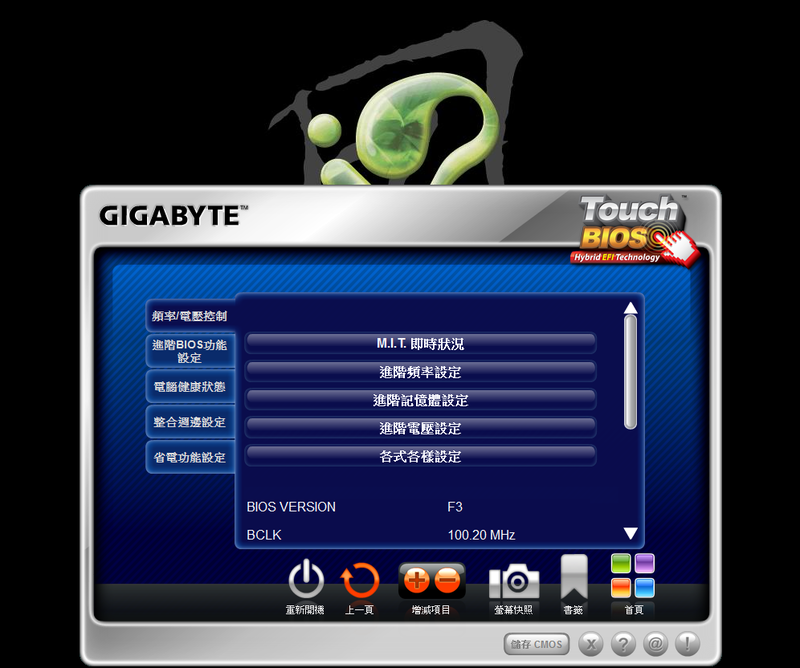 GIGABYTE hasn’t implemented UEFI interface, but it provides alternative solution called Touch BIOS software. 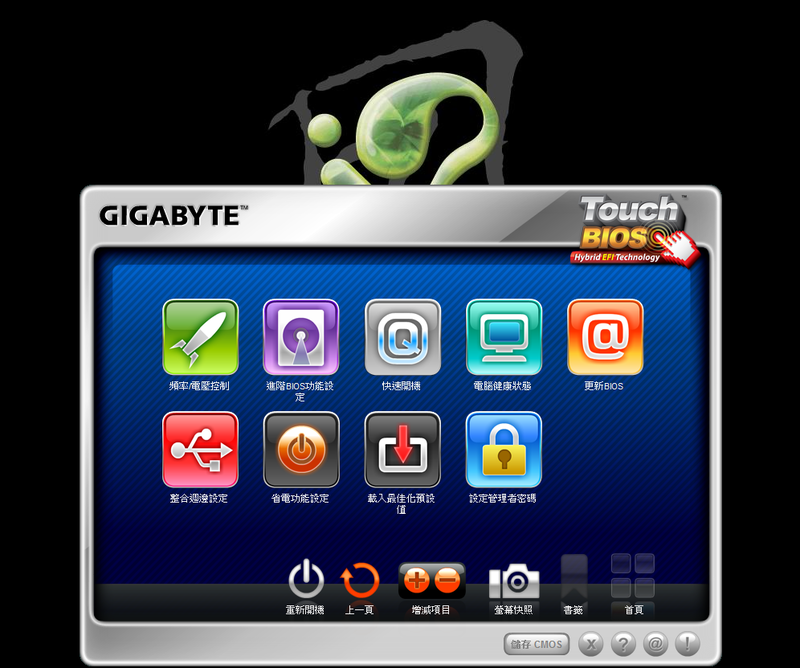 Users can adjust BIOS items in OS and also support touchscreen LCD. 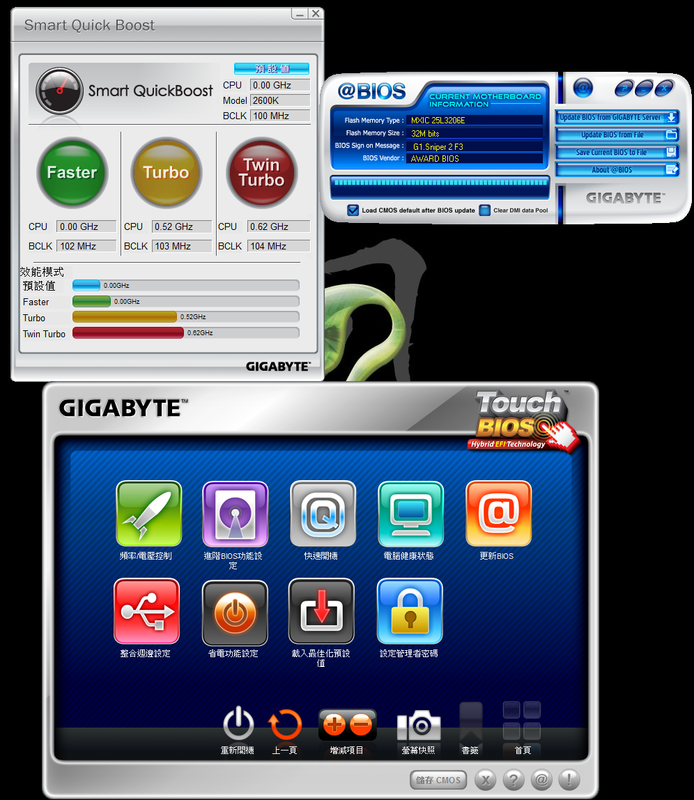 This software also integrates many GIGABYTE features. 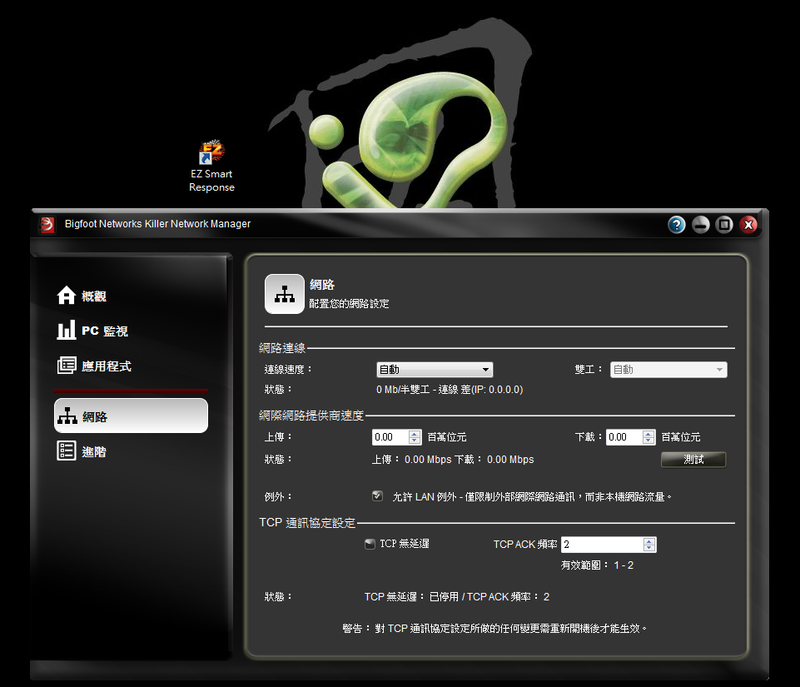 It also provide multilingual interface. The screen shot is Traditional Chinese. 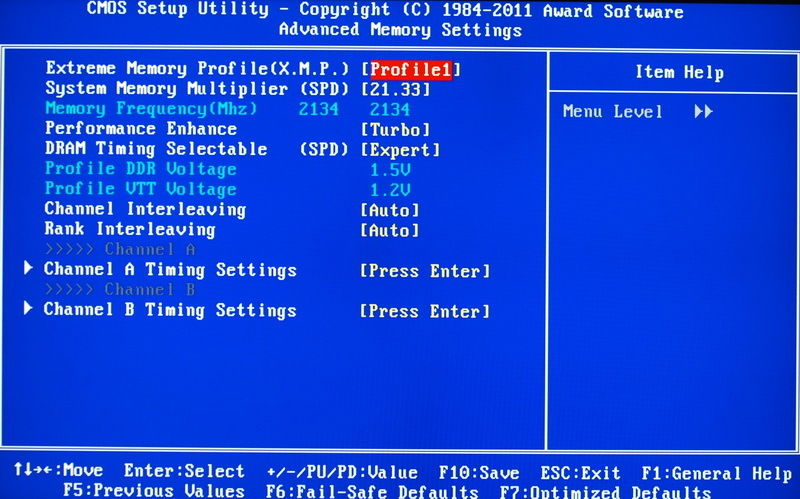 BIOS is not UEFI design, but it means user can use BIOS interface in OS? Clicking "Quick Boost" will enable "Smart Quick Boost" and “@BIOS" will enable "@BIOS". These two are GIGABYTE exclusive applications. Touch BIOS integrates both for users easy to install. This network manager features are very rich. Users can know the network status through this software. Upper left, EZ Smart Response, enable system HDD can switch to RAID model and enable ISRT under AHCI/IDE mode automatically. Creative provides Entertainment, Game, Audio Creation modes. The Game mode panel and items as right hand side. It includes rich fine tune items. Entertainment mode panel interface is familiar to me as my X-FI audio card. 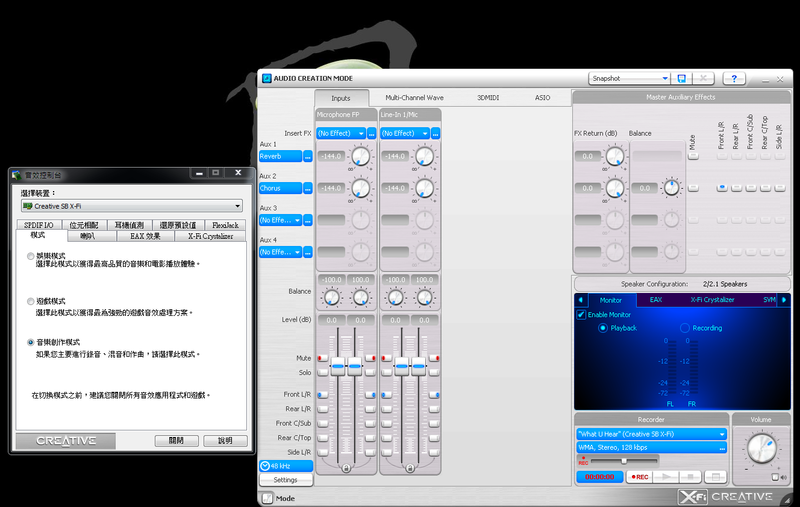 Audio Creation mode provides different panel and items. It looks like Creative own EMU audio panel, but actually the items and features are different. Previously, I tested the audio effect in G1 X58. I would like to repeat some key points. X-FI audio is well benefit the video or gaming multimedia. You can feel very good sound filed. No matter bass, fighting or demolish, it’s really shocked. G1 builds in such high end audio chip and caps, it’s good C/P for gamers. You don’t need to buy an external sound card. For who owns 2500K or 2600K, many people want to use at 5GHz. 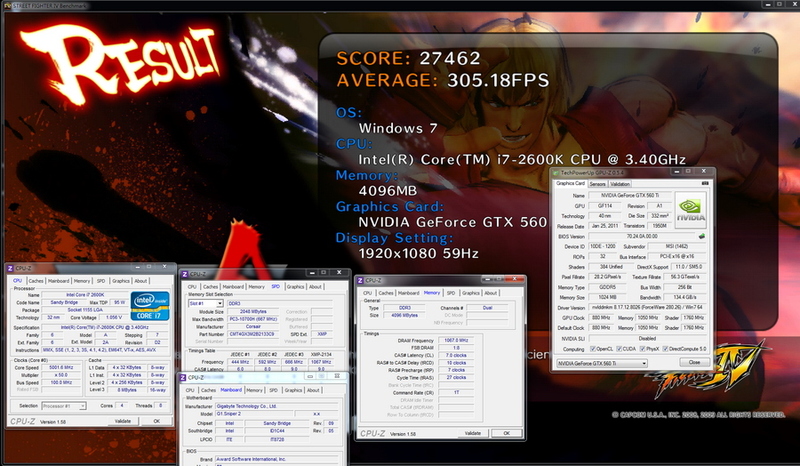 However, for this high range OC, you need good quality CPU and high end cooler. 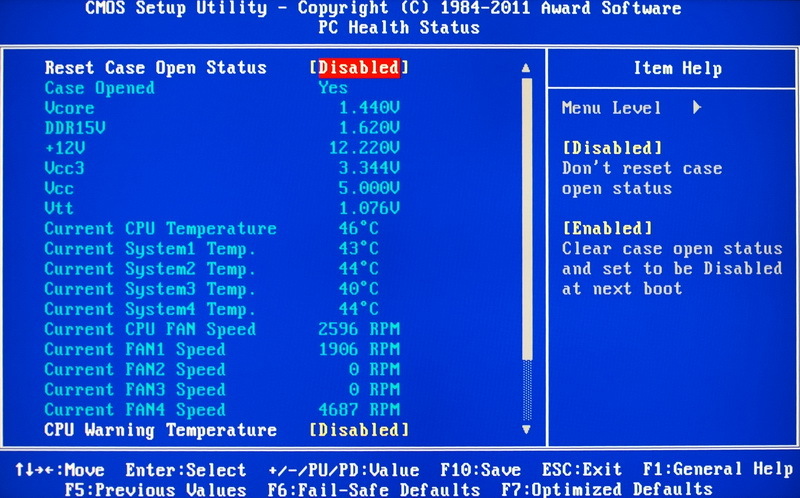 If you don’t set well, the system will be unstable and CPU will be in high temperature. 5GHz is love and hate setting. 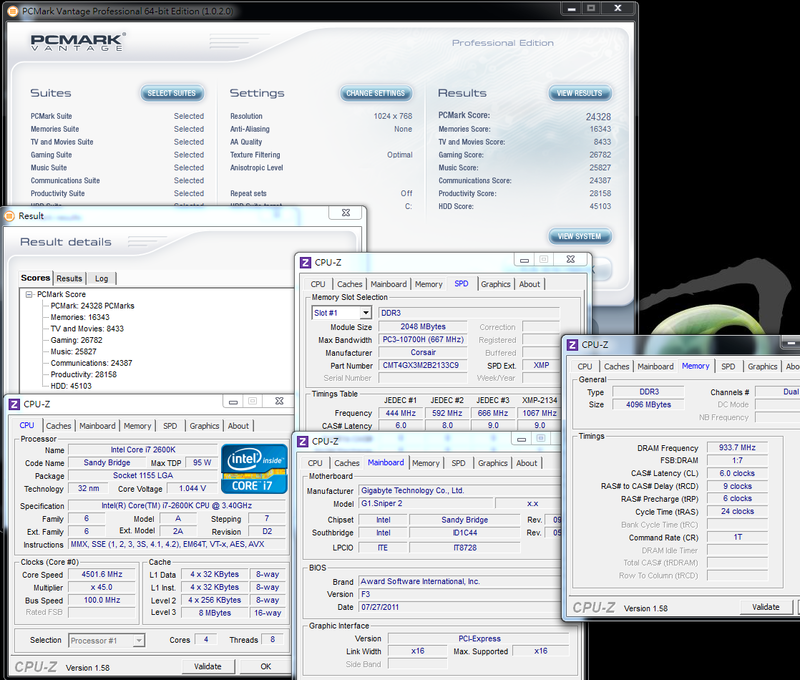 From 4.5GHz to 5GHz, the CPU performance increase around 10~12%. CPU performance enhance range is not much. However, 5GHz is an excellent feeling for most users. 2600K single core performance and OC range is the best in the market. The multi-tasking performance is only behind 6C12T 980X and 990X. AMD will launch 8-core CPU in the future, called Bulldozer. 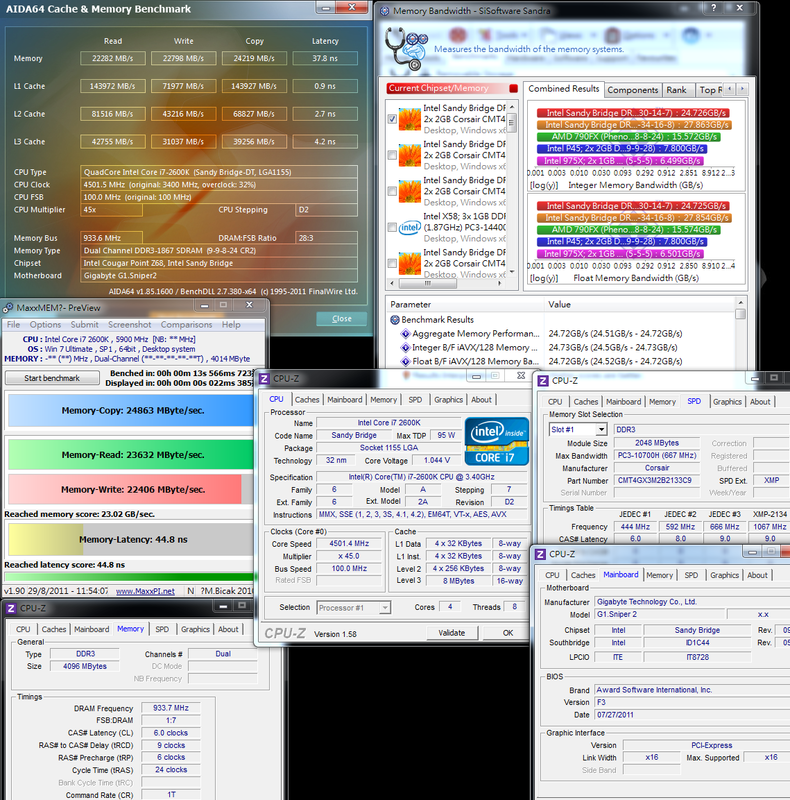 Its multi-tasking performance may be higher than 2600K. 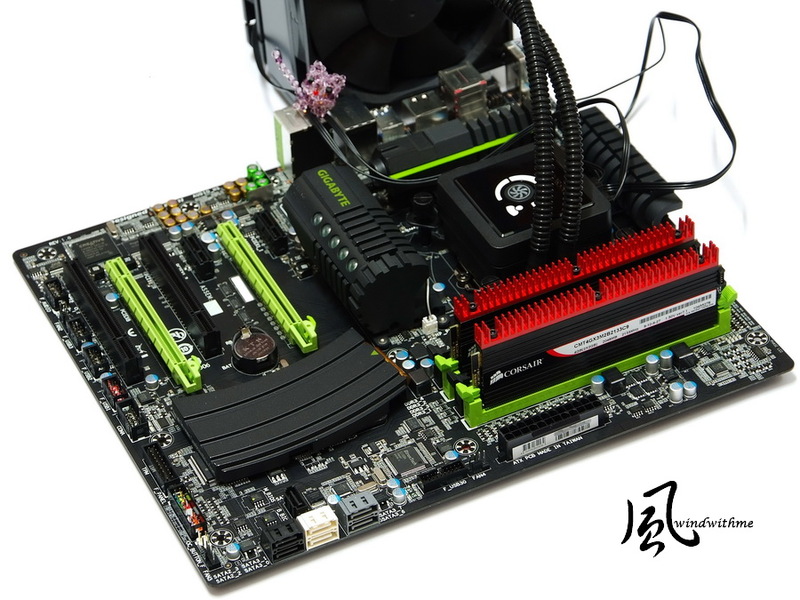 Z68 set DDR3 clock at 2133, the ADIA64 and MaXXMEM performance is over X58 DDR3 2000. But, Z68 Sandra benchmark is lower than X58. 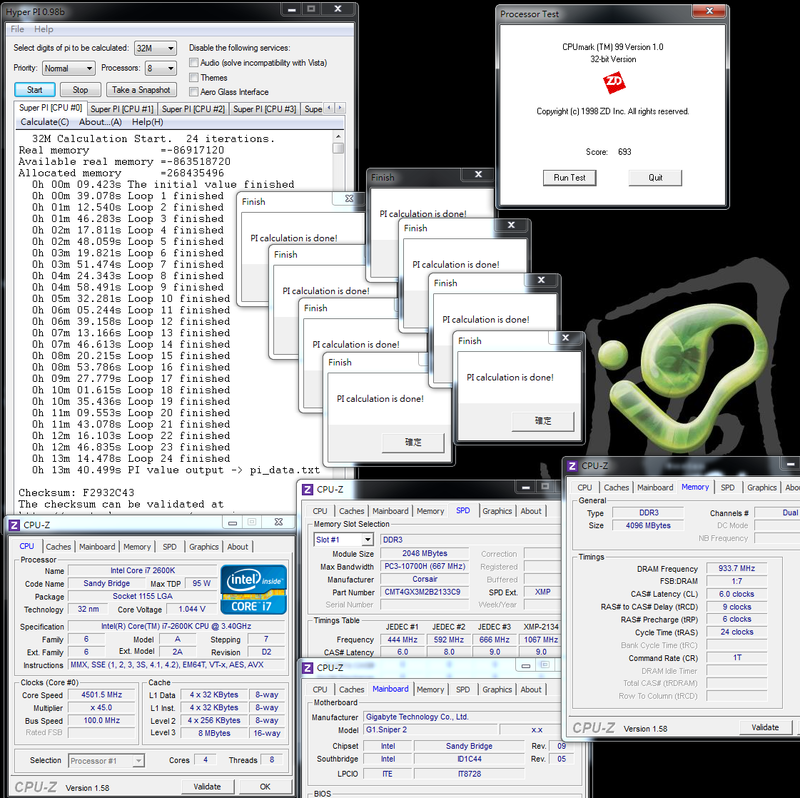 After Sandy Bridge enhance the memory controller, the performance can compete with 3-channel. 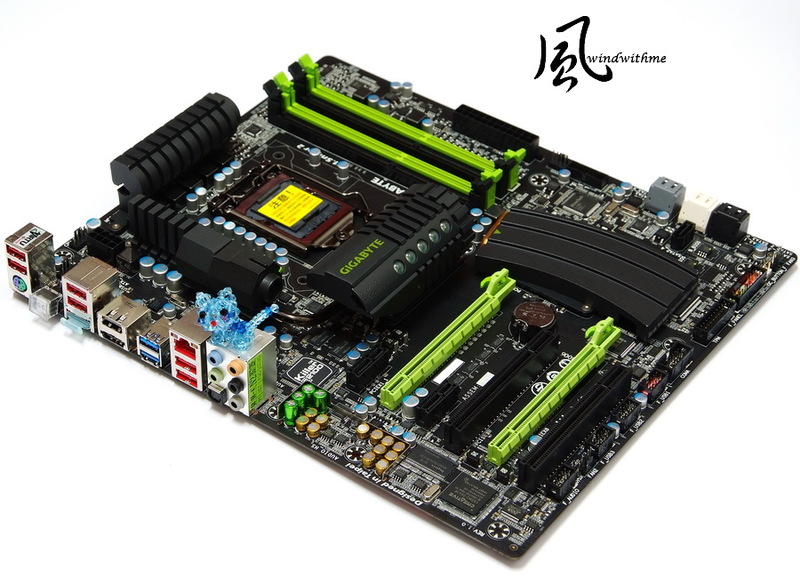 If you want to OC LGA 1155 DDR3 to 2200~2300, you have to pull CPU clock to over 100MHz first. Enter to OS desktop, the temperature is not big difference. 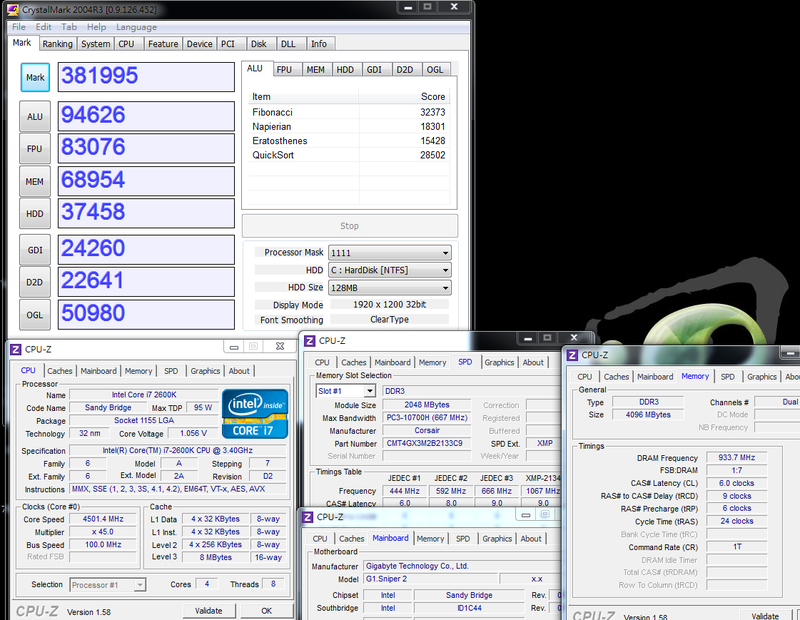 5GHz full speed max temperature is 80 which is also acceptable. There are 2 issues in OC, one is CPU voltage too low and the other is temperature rise due to CPU voltage too high. 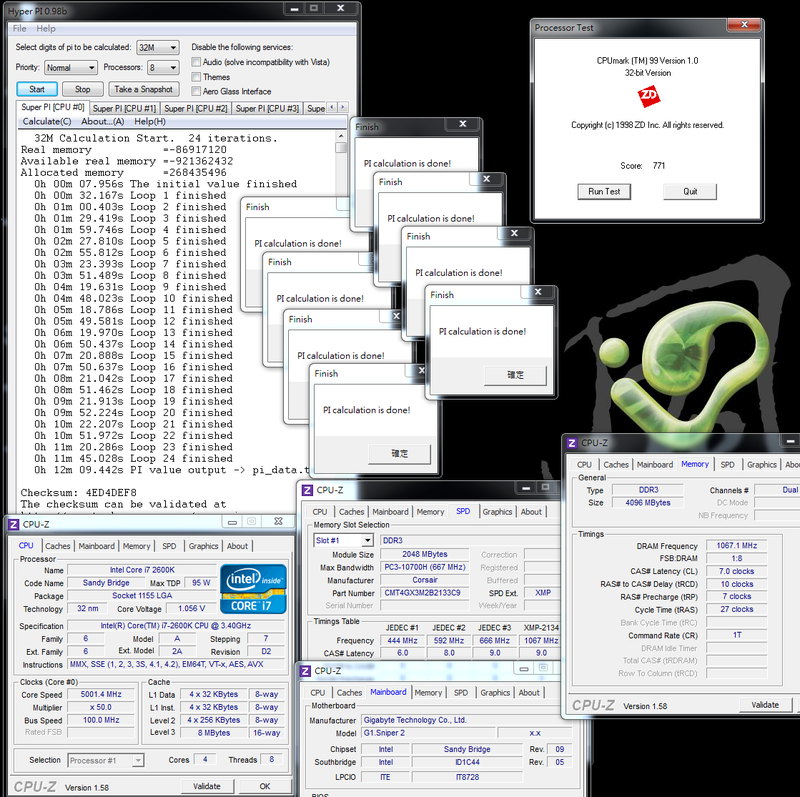 It takes your time to fine tune the best CPU voltage during OC. 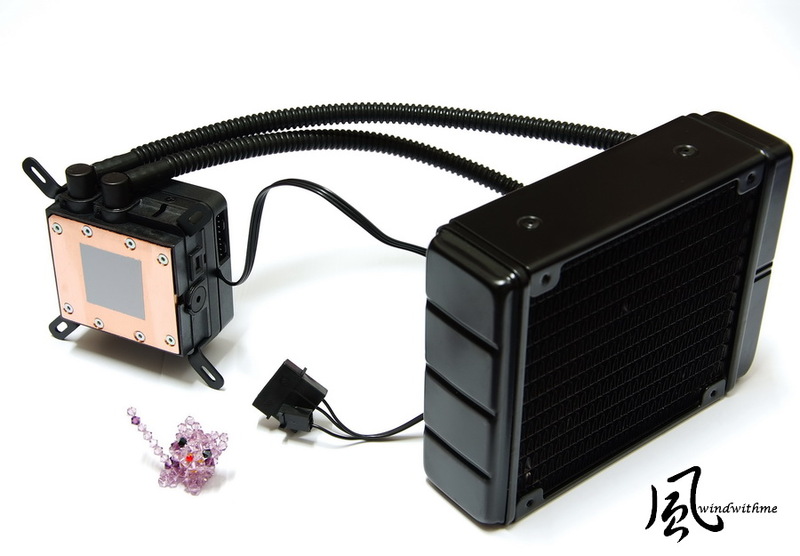 Using CORSAIR H80 water cooling system, the temperature is good. If it’s winter, the CPU temperature will be even lower. 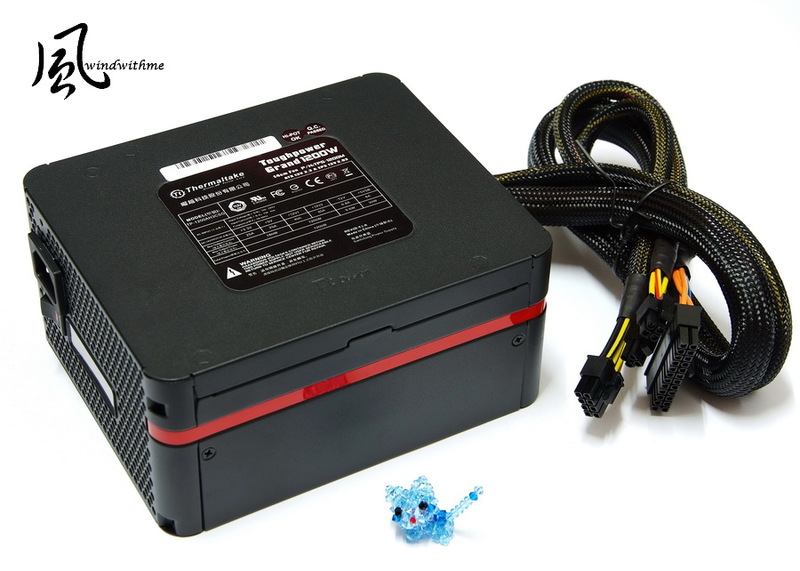 Power Supply is Thermaltake high end product, Toughpower Grand Series. Toughpower Grand Series is 80Plus Golf Certificate which is excellent performance for power saving. TPG-1200M is highest watt version in Toughpower Grand Series. Of course, all spec is the highest. My first impression is the shell design which is curve design. It’s dual 12V to support 40A and 85A. The max power output is 1200W. 14” dual ball baring flower shape fan is also special. The acoustic is very quiet. Modulized design is the must for high end Power Supply. It’s all Japanese made electrolytic and solid caps. The official warranty is 7 years. You can be more confident with Thermaltake. 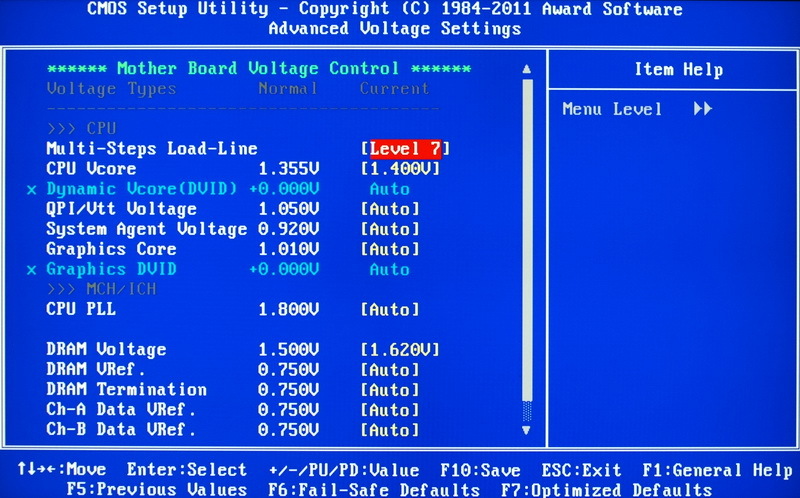 CPU voltage pull to 1.4V when OC to 5GHz, the power consumption only increase 16W when enter to OS desktop. Full speed is only 58W higher which is acceptable range. 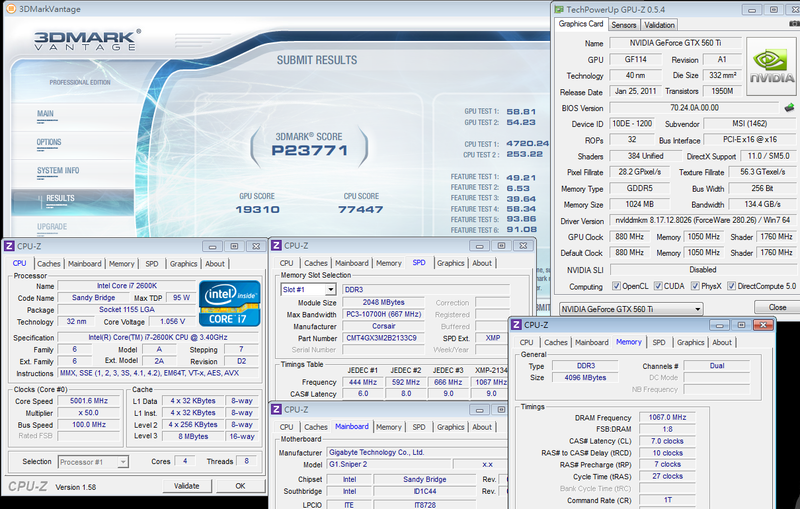 2600K OC 5GHz can be run stable in safe temperature range. Some users think bigger watt Power Supply will consume more power. It’s not a right idea. Like the same test configuration, if I use 450W PSU, the power consumption will be 14W higher. 1200W means max output watt. The power consumption level is decided by 80Plus grades. It’s like a big pipe. The water flow amount is decided by tap. 1200W doesn’t mean it always work under max power output condition. Higher watt Power Supply is mainly for upgradability. My friend used 550W in the beginning and he upgraded to 750W when he started to use SLi. 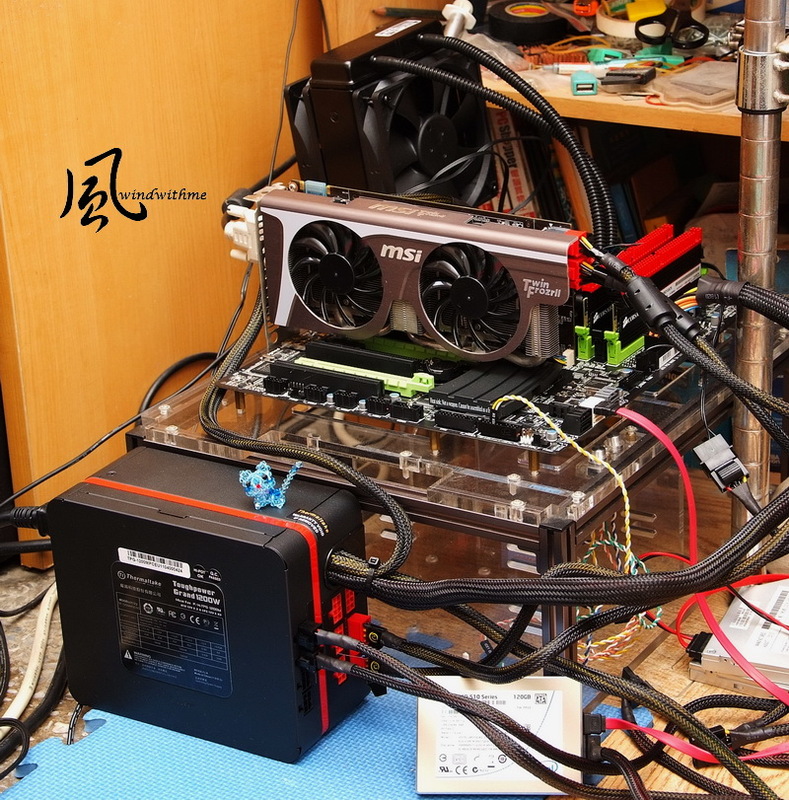 Recently, he upgraded to 850W due to buy more high-end VGA. 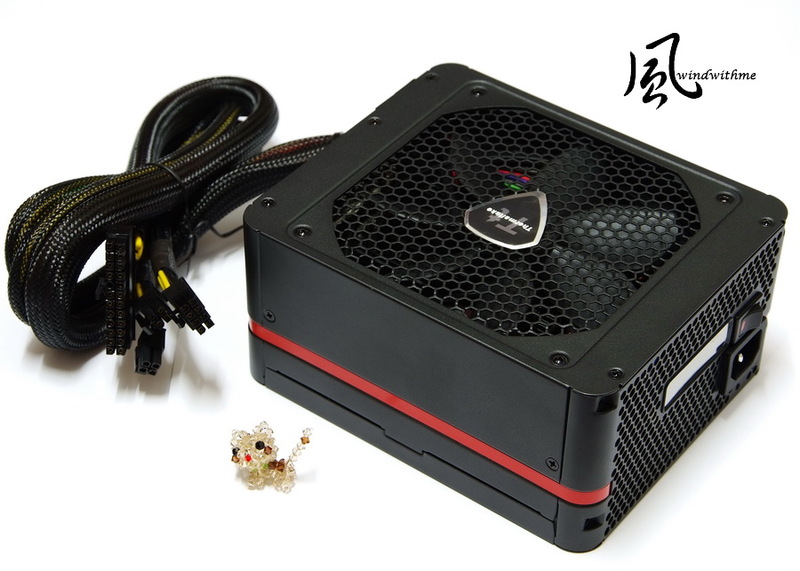 So if you would like to reserve some upgradability for game or VGA card, I suggest you better to get higher watt PSU. Due to Z68 PCI-E limited bandwidth, official spec cannot support 3Way graphics. GTX560 Ti performance should be satisfied by most gamers. If you need high resolution and effects, you can use 2-way SLi or higher grade VGA. 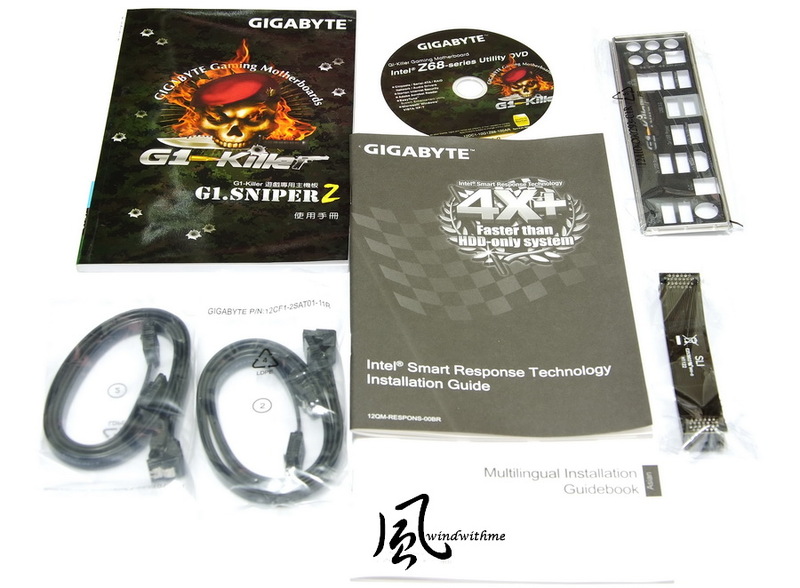 1.G1.Sniper2 is G1-Killer series which has top quality packing and components. 2.Built-in Creative CA20K2 audio chip with rare Japanese made high end caps and 128MB Memory cache. 3.Killer E2100 NPU chip with 1GB DDR2 cache provides better network traffic control. 4.High end Z68 with HDMI output supports Intel IGP exclusive Lucid Virtu technology. 5.Provides exclusive Front Access Control Panel to support USB 3.0 and quick OC. It also supports audio amplifier chip. 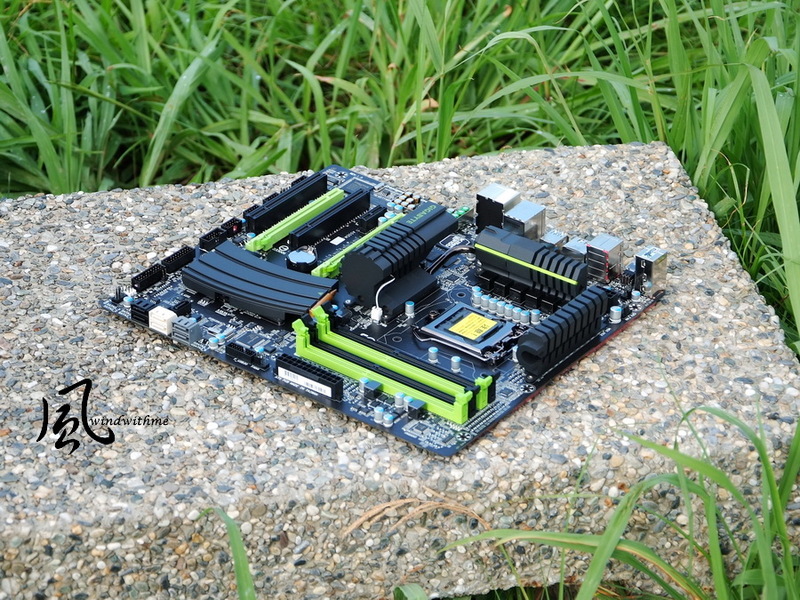 6.Special design military style heat sink has good quality and lookgin. 1.CPU PWM should provide at least 12-phase to fit the product price. 2.No external chip to support 3Way VGA. 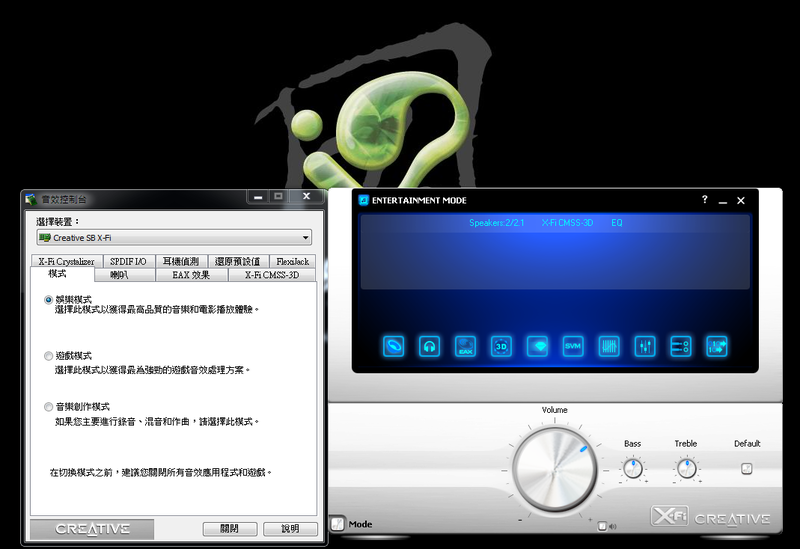 3.Can consider to make audio or LAN sub-card for more options. But it may cause users to have less PCI-E slots. For Intel Z68 exclusive Lucid Virtu Virtualization technology and SSD speed up Smart Response technology. I have shared in former several Z68 articles for detail introduction, using guide and performance. Currently, entry Z68 and high end one price difference is around 1.5~2c times. The main reason is components and spec. G1.Sniper2 positions at Gaming market. The audio and LAN chips are the top level in MB. Now the high end MB is for OC or Gaming. G1.Sniper2 integrates both advantages. If you buy same level audio and LAN cards, it will cost you much. G1.Sniper2 price is top. These two hardware components can enhance the product value. 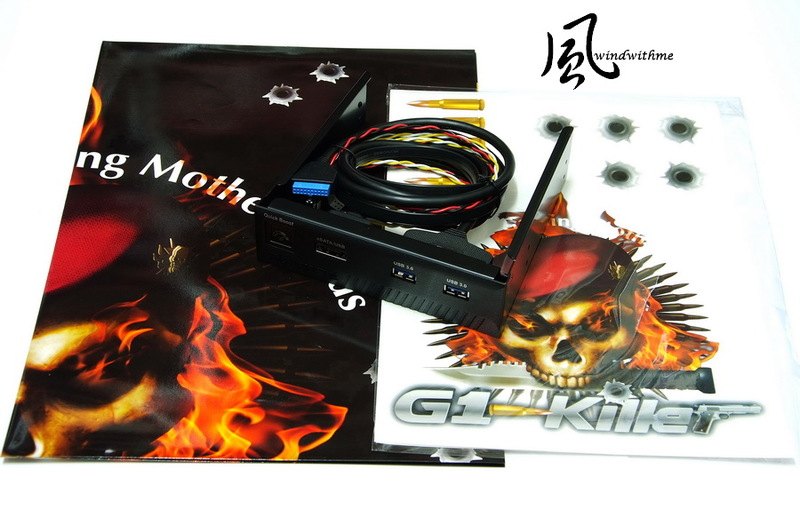 For looking for high end and OC Z68 gaming lovers, G1.Sniper2 can put into your wish list. Former, some readers suggest me to test more mid-end product, so this year I am trying to review more mid end or entry products. 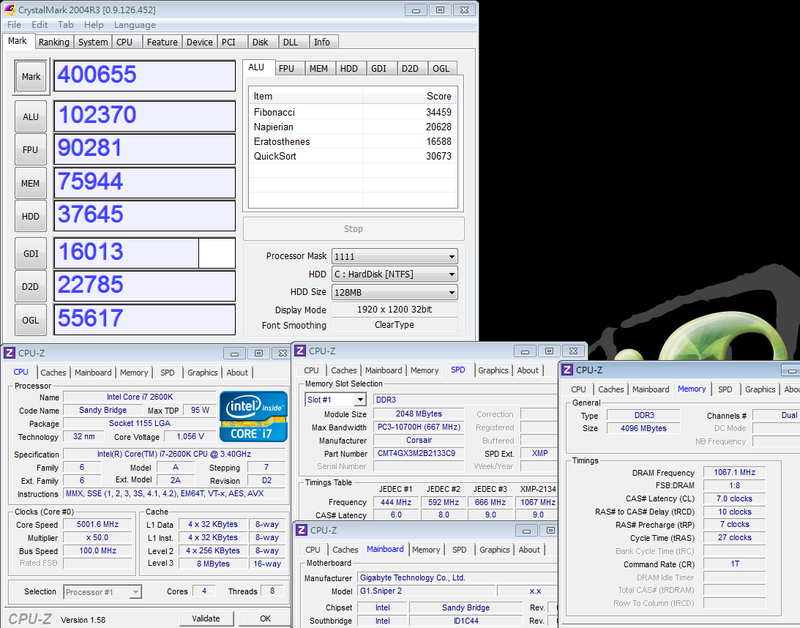 Like H61/H67, Pentium G620 and Core i5-2500K, if you are interested, you can search for that. 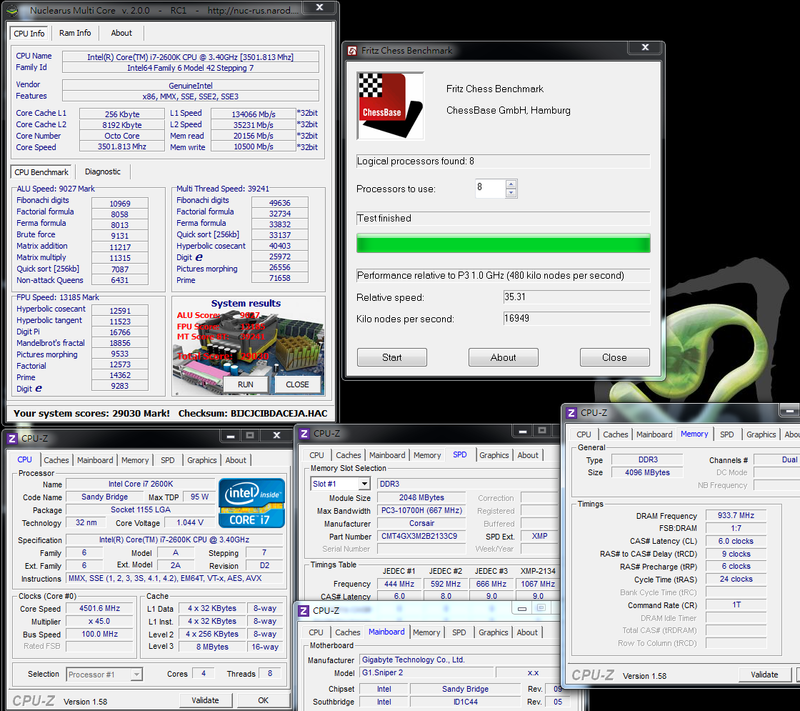 This review takes me over 3 days, due to take pics, BIOS set and OC fine tune. Some readers may think it’s too long to read. If it’s possible, I am considering to separate into 2 parts like very popular Taiwanese movie, Seedig Bale. Last edited by windwithme; 09-23-2011 at 02:50 PM.